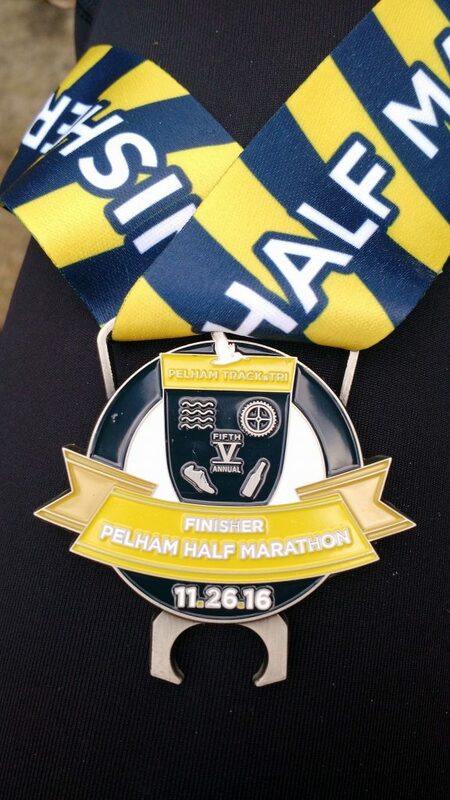 On Nov. 26th I ran the 5th Annual Pelham Half Marathon. 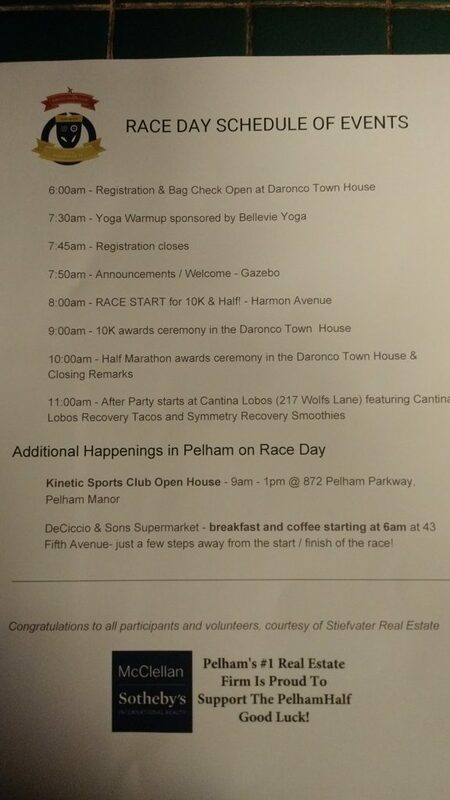 The Pelham Half is a fun local race that I’ve run every year since moving to Pelham. I won’t bore you with repeating info about the race I’ve posted before. 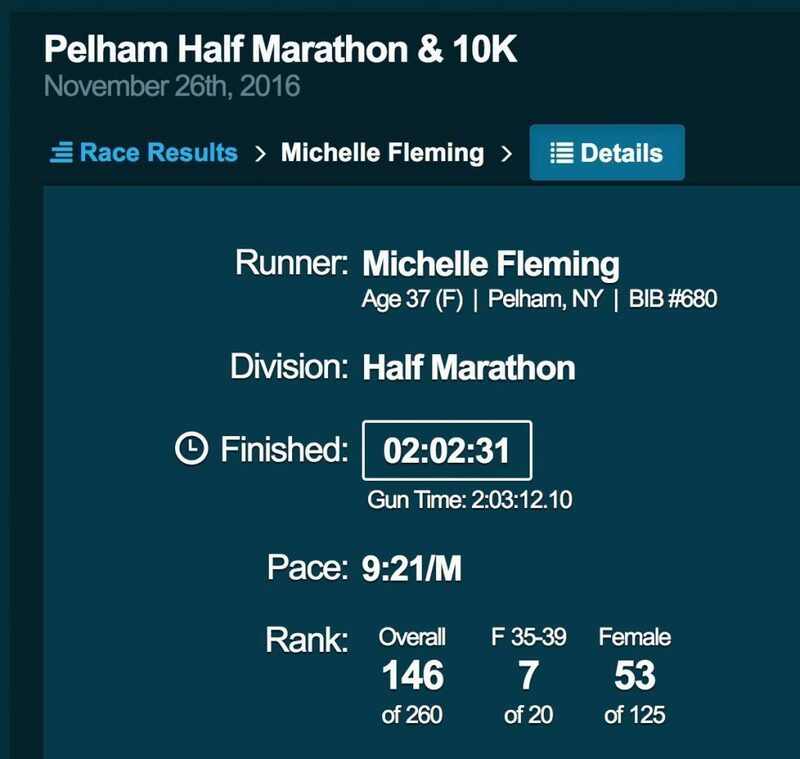 If you’re interested in reading past adventures at the Pelham Half you always can find those by going to Race Recaps. The only thing I like as much as running is writing. 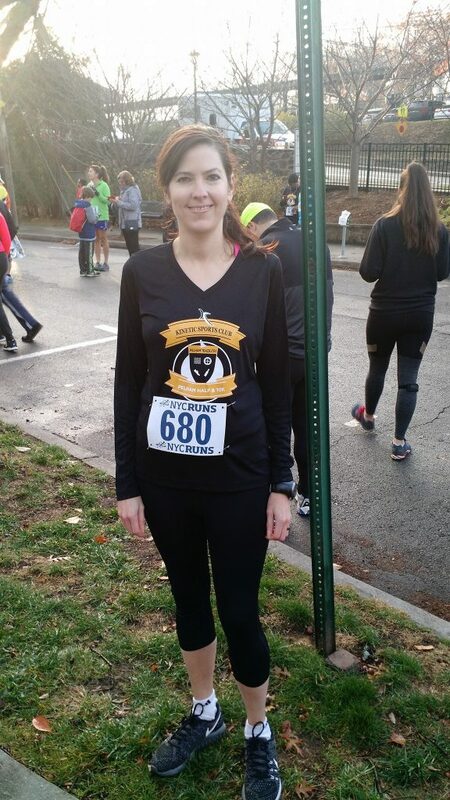 This year I was lucky enough to do a guest blog for the Pelham Half! If you want to know my Top 5 Reasons to Run the Pelham Half click here for the blog. It’s short. Read it. You won’t be disappointed. You can always come back here afterwards. Race packet pick up was at Cantina Lobos. The Pelham Half swag was awesome. Usually you just get coupons at races. The Pelham Half didn’t just get discounts for the runners. 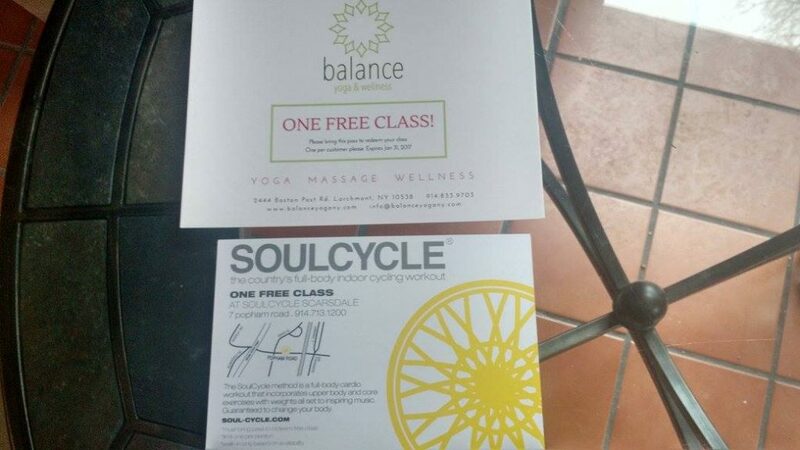 They got entire free classes. The race bag also these packets in it. 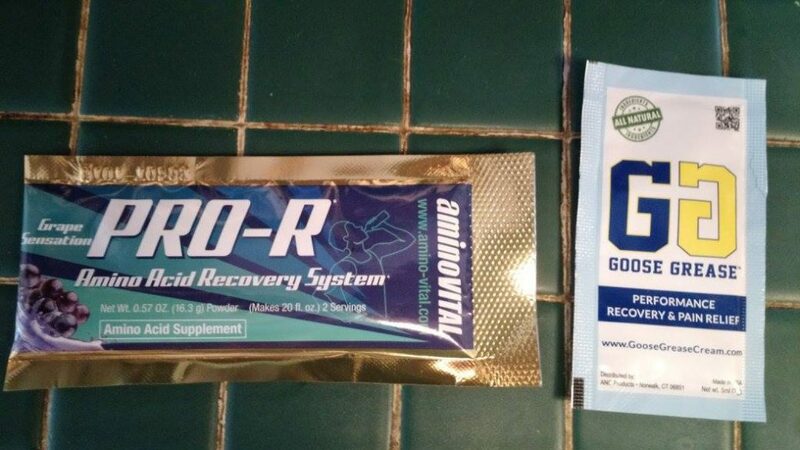 The PRO-R was a powder supplement you mix in water. They had it instead of Gatorade along the course. I’m not a fan of Gatorade at races because it’s high sodium and just makes me thirstier than before. This stuff had about half the sodium. It didn’t taste great but it didn’t taste awful either. After Kevin and I picked up the race packet, we grabbed some dinner at J Cafe, and then on to the Pelham Town Hall to pick up some traffic cones and signs Kevin needed for volunteer duty at the race the next day. Have I mentioned my significant other is the world’s most supportive race husband? Because he is. More on that later. After all the errands we had a late night (for us) date and saw Fantastic Beasts and Where to Find Them at the Pelham Picture House. Kevin had to be up even earlier than me the next morning because he signed up to place traffic cones and signs at all major turns from 6-8 am race morning. Because Kevin was not at the house to prod me awake I got a late start and for the first time ever was so late I didn’t eat breakfast before the race. I dumped some Vanilla Whey Protein Powder (Doesn’t this sound delicious? Mmmm Vanilla Whey Protein) in the blender along with some milk and a frozen banana (I keep those on hand for smoothies) and called it good. I make a conscious effort to bump up the protein when I’m training for something and given that I’ve been in training for basically twelve months I always have this in the pantry. I was kidding about it being delicious. It is not delicious, but it is okay. It’s also super simple to just make a smoothie once a day as a way to get the extra protein. Another consequence of Kevin not being around was that I had to pin myself. You can tell in this photo that I pinned the bib instead of Kevin. Look at that. Bunched up and off center. This photo probably makes Kevin want to reach out and straighten it. The tech shirt was included in the race fee and was great quality, unlike some of the race shirts I’ve gotten in the past. If you want to read about the world’s crappiest race t-shirt click that link and scroll to the bottom of the blog. It was not a Pelham Half shirt by the way. The race organizers had a great schedule planned. After the coordinated among us got their yoga on off we went. This was the Fifth Annual Pelham Half but it was a brand new course. The race director and his wife were kind enough to start the race at their house the last few years but at some point one gets tired of Porta Potties in the yard and decides it is time for a new location. Another awesome thing about the Pelham Half is they do preview runs of the race course. They offer free practice runs, complete with pacers to run your pace, a month or two out. The previews run the first part of the course, the second part, and the entire course. So even though this course was new I’d had the opportunity to run it before. This was a big help. I knew what hills were coming up, where they were, and how hard they were. So there was no disappointment or frustration by surprise difficulties. It was also a lot of fun getting to know the other runners in the neighborhood on the preview runs. Another big help? Have I mentioned my husband is awesome? During the final preview run we ran the whole 13.1. I asked Kevin to leave some water out on our porch for me since the race went past our house. That turned out not to be a great option because we pass by our house very early in the race. So Kevin bought bottled water for the group and met us at the half way point and near the end to hand out water. 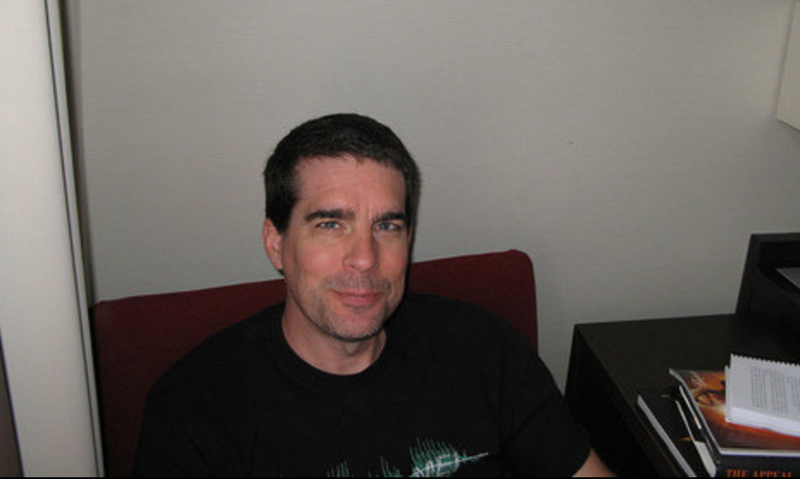 If you see this guy tell him he’s amazing and slap him a high five. The race went smoothly even though I didn’t do as well as I’d hoped. My time was great given all the hills, but I’d gone into it wanting to get an age bracket award. The top 3 female finishers in the 35-39 category took home awards. I hadn’t put in enough training to get there. There’s always next year. In news of interesting race stories I have one for you. I’ve been running twenty years. 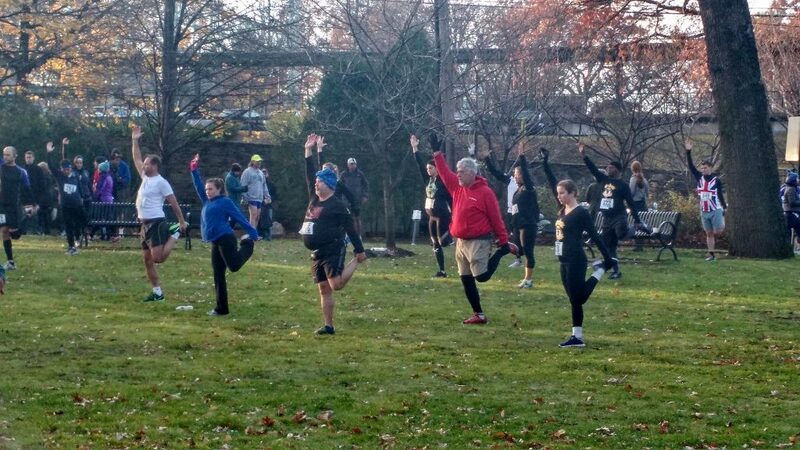 I’ve run alongside people who sing to themselves during these races. Plenty of people sing to themselves when you’re running 13 miles. But this was my first time running near someone who yelled loud affirmations to himself when things got tough. Every hill I was treated to a booming “COME ON! COME ON YOU F***ER! !” It was definitely motivation. He was just behind me and at first I heard “HOO-RAH! HOO-RAH!” Then the F bombs started. Whether he was talking to himself or the hill I don’t know, but I ran a little faster because I wanted to stay ahead of him. Post race they had tables set up where you could get stretched out/massaged and there was no line! I felt okay so I left the tables for the runners who really needed it. After the race Kevin dropped me off at home and then went out to pick up the cones/signs. He also took home a race souvenir. If you follow me on MapMyRun you may notice I’ve been running in the morning lately. Not my norm. So many questions in those run records. The course marshals were given cow bells to cheer on the runners and Kevin got to take his home. It is a great and fun idea. Unless you are not a morning person and your spouse has to drag you out of bed. True, I do often tell Kevin that I would like to wake up early the next morning and get my run in. But that is the night before. It is not what I want in the morning when I actually have to get up. 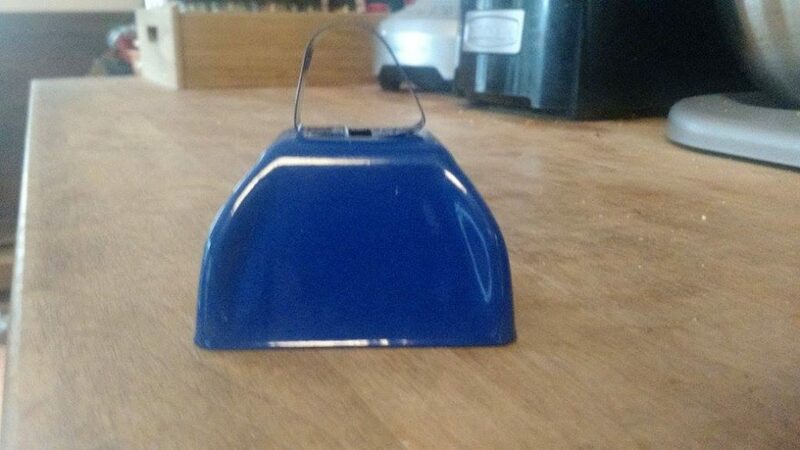 Kevin told me if I did not wake up he was going to use the cow bell. I generally believe what Kevin says. So I get up to avoid the cowbell. Do you see that photo of him above? Can you picture little devil horns on him in that photo? I can. If you’re interested in seeing a short video of highlights from the race, including one of the more inspirational moments, click here . There was a 10k going on at the same time as the half. That’s 6.2 miles. A gentleman completed the 10k while heavily relying on use of a walker. You can see him near the finish 39 seconds from the end of the video. You’ll also see a lot of yawning runners at the beginning. It was early. For those keeping score, this was the 10th half marathon distance for me in 2016 and I have two more to go to make my goal of 12 half marathon distances in 2016 as part of the 12.13.16 challenge. You can see all the deets on my blog here , but the gist of the challenge is to run 13.1 consecutive miles 12 times in 2016. I travel just often enough that committing to 12 actual races is logistically impossible, so some of these runs are in my neighborhood. The last half marathon I’m doing in 2016 is the NYC Runs Running Festival of the Lights aka the Channakah Chalf. I debated running the final 13.1 solo in my neighborhood but it seems sort of anticlimactic so the Channakah Chalf it is. I’ll likely be doing the 11th 13.1 in my neighborhood this weekend. My 2017 run goal is going to be a fall full marathon, my second full marathon. I figure it will be a helluva lot easier to accomplish this than running twelve half marathons in twelve months was. I plan to take it easy in 2017. Way easy. Kevin had a bunch of frequent flier miles and rewards points to use. So, the next trip blog you’ll see will be coming at you from Hawaii! Toronto waterfront marathon 10-22-17. Something to think about. Congrats on your almost 10 half marathons so far this year.